Orange and green is perhaps one of the most desired wedding color schemes for this year as the colors are classic, bold and ideal for every season. 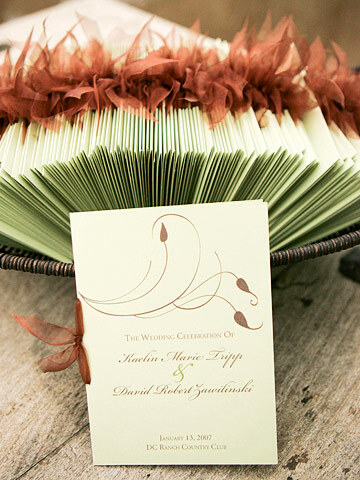 From the bouquet and the bridesmaid dresses to the wedding décor and the invitations, orange and green can be spectacular. Orange flowers include roses, snapdragons, birds of paradise, tulips, orchids, alstroemeria, gerbera daisies, and mango calla lilies. Green flowers include roses, gladiolas, orchids and hydrangeas. Shades of orange include pumpkin, amber, coral, persimmon, rust and salmon. Shades of green include sage, emerald, forest, lime and apple. The colors are magnificent! Each bride to be is aware of the amount of time it takes to prepare for their wedding day. A wedding is one of the most special days in the life of a woman, and today’s grooms are more involved than ever. We’ve put together some fabulous ideas for a brilliantly beautiful orange and green wedding color scheme in order to ensure that the entire wedding is as beautiful as you, the bride herself. Once the vendors are hired, the shopping and planning begins, and this is one of the most exciting times of life. With each decision you make, you are that much closer to your special day being the day you will remember for life. It is an occasion that is an once-in-a-lifetime occasion, and one that you can cherish for eternity. 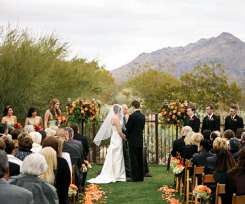 With that being said, let’s move on to some ideas that will help to create that perfect orange and green color wedding scheme. When you choose your bouquet you want to consider the blooms you’d like to use that express your personality. You’ll also need to consider whether you’d like a casual, semiformal or formal boutique. Another thought to consider when assembling your wedding bouquet is that designers suggest that brides match the size of their bouquet to their gown or train’s length. The most popular types of bouquets are a cascade bouquet, a nosegay bouquet, arm sheaf, flower bracelet. 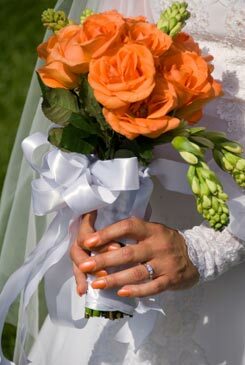 Following are pictures of some gorgeous bridal bouquet pictures that demonstrate the various shades of orange. As you can see from the light apricot to the deep orange, the color is brilliantly suited for any time of the year. 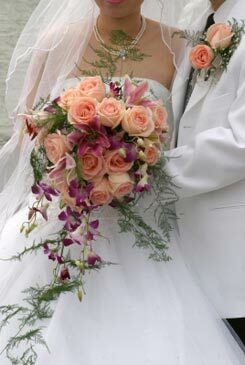 The cascade or shower bouquet with orange and pink flowers is one of the most beautiful boutiques for a classic wedding theme. As you can see the cascading bouquet (although you cannot see the bride’s gown) is perfectly matched to complement the length of her gown. 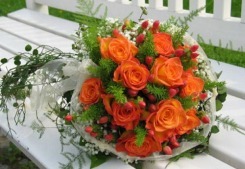 The ballerina bridal bouquet with orange and green flowers is ideal for a fall wedding. 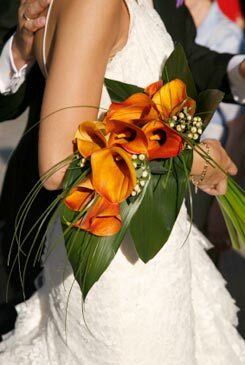 The Orange calla lilies bouquet, sheaf or arm bouquet is a fabulous boutique that is ideal for an elegant wedding. The orange biedermeier bouquet / trail bouquet is a romantically beautiful bouquet and again, you’ll notice that the size of the boutique complements the bride’s train. 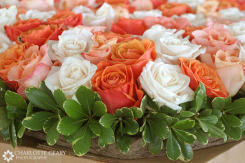 This bouquet is composed of large orange roses and a beautifully soft bouquet for any time of the year. With each bouquet that is pictured, the blooms express the bride’s personality, as well as suit the season and the theme of the wedding. 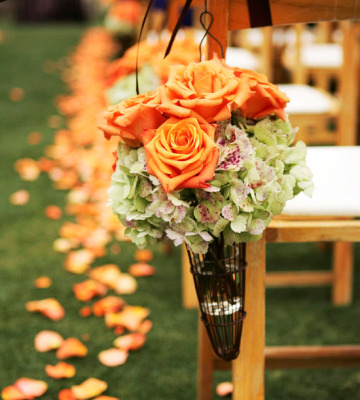 The range of orange hues is soft to bold and everything between and the color is definitely one of the most fabulous colors to express the modern as well as the traditional bride. Whether a traditional church ceremony, or a beautiful outdoor ceremony, the dressing of the chairs and alter are just as important to signify the couple’s everlasting love and the beauty of the event. There are many beautiful ideas from rose pedals and chair vases to standing arrangements that are ideal for wedding themes. The soft rose pedals highlighting the isle and the beautiful chair vases that decorate every other chair offer a soft elegance that truly add to the meaning and beauty when the couple celebrates the joining of their union as husband a wife. A close-up of the chair vases below shows the beauty they add to the setting. 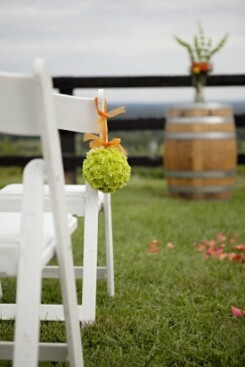 Below is another outdoor orange and green wedding color scheme. This is another beautifully romantic, picturesque scene that depicts the pedals that have been scattered down the aisle and one simple bouquet that has been draped on the first chairs. 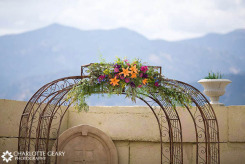 The beautiful iron arch pictured above is magnificently decorated in the orange and green color scheme with a touch of purples and blue, and it is truly a romantic display of beauty and one that signifies love. 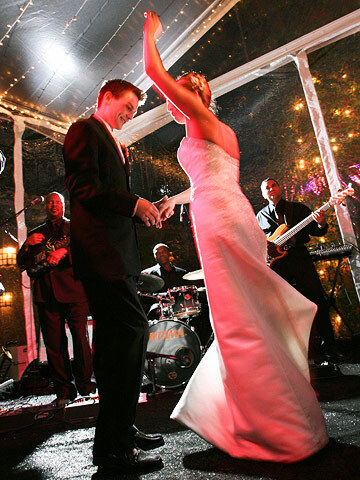 Some claim that the wedding reception is the most important part of the wedding. I, personally, think that every part of the wedding is the most important element, as there is not one part of the wedding that you won’t look back on and remember- not even the photographer! It is important that a great deal of consideration is given to each aspect of the wedding, and the reception is a very important part, as it is the celebration of the union of husband and wife. 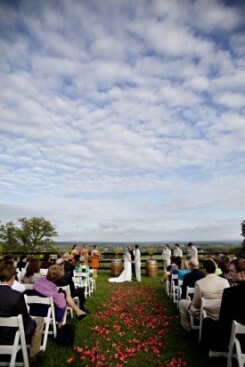 Whether a formal wedding or a casual wedding, you want an occasion that is beautiful and romantic. Not only should it express your personality, but it should also reflect your love, and the union of your lives. 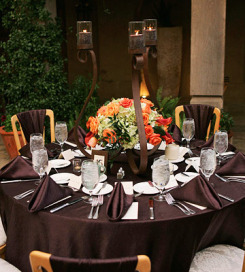 The deep orange in this table setting is simply elegant. The table’s centerpiece is truly romantic with a soft candle glimmering and the green of the color scheme accenting the deep orange. Truly beautiful! As you’ll notice, the lighting in the room also plays a significant role in the scheme. With a brighter lighting, the setting appears softer. Should you dim the lights a bit, the setting is one that will become elegantly romantic. Roses are not only a symbol of beauty; they are a symbol of love and make a spectacular table centerpiece as you see from the picture above. This table setting is another gorgeous table setting. As you’ll notice the table setting includes rich, deep tones that are beautifully accented by its centerpiece, which creates a truly elegant and romantic sight. The atmosphere of the reception is something else to consider. The atmosphere should spell aura and should express the significance of the day. 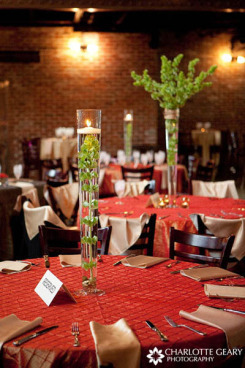 The atmosphere helps add to the celebration and it should be suited to the wedding theme. 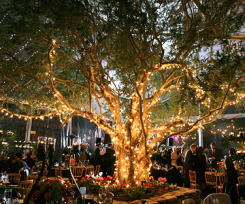 Accenting a tree with soft lights is another beautiful way to add a touch of elegance to the celebration. As you can see from the picture above, this type of display adds a special elegance and romance which truly enhances the setting as the bride and groom celebrate their union among family and friends. Designers have many tips when it comes to the wedding cake with the first being to choose a reputable bakery. You not only should obtain testimonials from previous customers, but, also visit the bakery in person and meet with the staff. When you walk out of the bakery, you should have an image of the cake. Time is also a consideration and you should allow yourself plenty of time to pick out a cake. Also, you’ll want to be sure that you indulge in plenty of cake tasting before you order your cake. The traditional “white” cake is no longer a must, and there are plenty of flavors to choose from. The next tip is to get creative with the design! Color coordination and decoration can make a cake truly come to life. Brides today can include everything from ribbons, to rubies on the cake itself. The tier cake is definitely the tradition in a wedding cake and one that is quite beautiful. 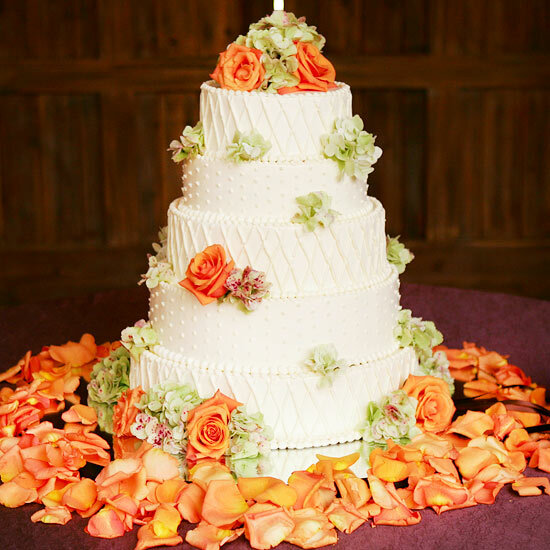 The classic beauty of the cake above with intricate details and the orange and green color scheme is ideally suited for most wedding themes. This year there’s an array of wedding cake designs to choose from, and the best means of conducting your research of a local bakery is through the Internet. As the designers suggest, be certain to allow yourself enough time to choose a wedding cake. This is truly one of my favorites, with the gentle swaying lines, and the soft sage envelopes. When I look at the picture, I see magnificent detail that seems to capture the significance of the event and the couple’s love as well through the use of ideally suited colors. Orange and green is truly a combination of two spectacular colors which can be the perfect color scheme for the traditional bride, as well as, the modern bride.